South Lake Tahoe hiking – embark on an adventure into unspoiled wilderness! Lake Tahoe hikes are an excellent way to experience the natural beauty of the region. Fill your lungs with pure mountain air, burn some energy on a challenging slope, and then pause to rest at the summit and take in the gorgeous views. South Lake Tahoe hiking trails are your gateway to amazing natural wonders. 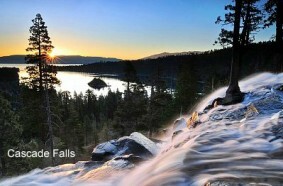 Grab your hiking shoes and be sure to pack a swimsuit when you hit the dirt of the Rubicon Trail, a 3 to 5 mile hike that dips up and down along the shoreline of Lake Tahoe, winds around Emerald Point and ends at Vikingsholm Castle. The 5-mile Mt. Tallac Trail starts off with an easy hike to Floating Island and Cathedral Lake. Then the real challenge begins as you head up the steep front face of Mt. Tallac and end your experience with breath-taking views of Lake Tahoe, Fallen Leaf Lake, and Desolation Wilderness. Explore the 63,960 acres that make up Desolation Wilderness and find many Lake Tahoe hiking trails that wind around granite peaks, and through alpine forest glades and glacially-formed valleys and lakes. Test your skills on the famous Tahoe Rim Trail. This scenic 165-mile long trail follows the ridge tops of the Lake Tahoe Basin and is popular with backpackers, equestrians and mountain bikers. When you are ready for a real adventure, Lake Tahoe hiking offers a journey with awe-inspiring views and challenging trails.